A lot of us are on limited budgets going into the holidays - and maybe you are like me, and wondering what to get that person or two left on your list. And heading to the Mall during the holiday rush is not something I want to do when I'd rather be spending time with loved ones. What better way to serve both of those things though, than by shopping for a cause today? 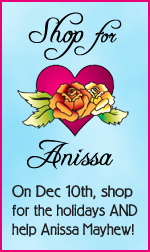 Today is Shop for Anissa Day at Aiming Low. Anissa is a new friend of mine over the past six months; a wonderful mother of three, loving wife and all-around fab diva. She writes a blog at freeanissa.com. Anissa suffered a terrible stroke last month, and is still in the hospital today. Her husband has been giving updates about her improving condition at their family's other blog: www.hope4peyton.org. Aiming Low is Anissa's other blog project - a fun, witty site full of laughter and friends. The ladies at Aiming Low are putting on a great benefit today to benefit Anissa's family during this tough holiday season. 70 online stores and vendors are donating part of the proceeds today to the Help 4 Anissa Fund. This fund will help offset the massive costs incurred through this whole hospital and upcoming rehab process for their family. The vendors included in the sale today are all over the board and are offering some fantastic products. So if you are still wondering what to get that special someone, that co-worker, or your Grandma, check out Aiming Low today and shop, knowing you are helping out another very special someone and her family.